* TIMING... SNOW WILL CONTINUE THROUGH THIS EVENING. HEAVIEST SNOW IS EXPECTED THIS MORNING THROUGH EARLY AFTERNOON. We're awaiting another five to eight inches in Pittsburgh. Our snowfall for the winter is a record, about 50% over the old mark, and most of it's fallen in the last couple of weeks, and is still on the ground. Too bad about all that snow. Up here in Vermont we missed all those storms. Had a thaw up here early in January and I haven't seen any snow in my yard for 5 or 6 weeks now! Much of my gaming time was spent shoveling, keeping a path clear for our new puppy or making certain he didn't get lost in a snow drift! I did get some done mind you but not what I hoped for. Seemed wrong to play DG's new Destruction of Army Group Centre in a blizzard. Finally done! Meltage outside. Driveway clear but the snow drifted so high on the back fence that Sheridan could crawl up and wiggle out! "We have had complete coverage singe 6 Dec..."
Those two probably could scare him! Let Al come talk to me about Global Warming 0 I'll sic Sheridan and Grant on him! It's not today... 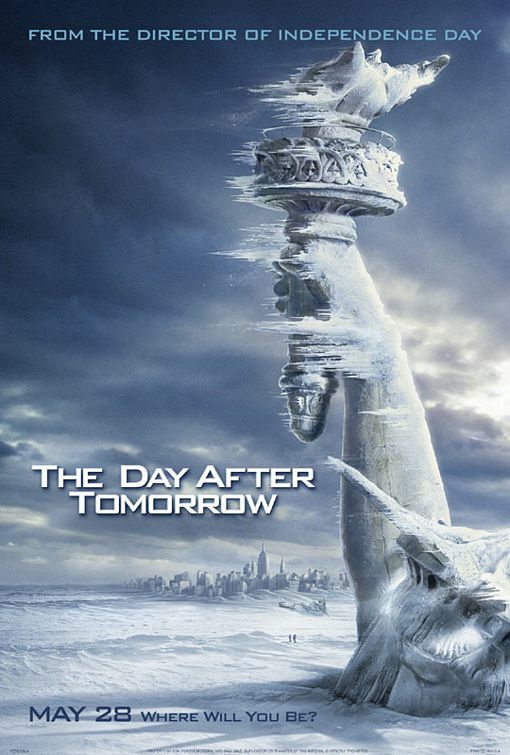 It's the Day After Tomorrow! Bad enough at the momemnt that the dogs soon come in.